We’re starting to look at how our minds organize sentences. We’ll see that within each sentence, our mental grammar groups words together into phrases and phrases into sentences. We saw in the last unit how we can use tree diagrams to show these relationships between words, phrases and sentences. The theory of syntax that we’re working within this class is called X-bar theory. X-bar theory makes the claim that every single phrase in every single sentence in the mental grammar of every single human language, has the same core organization. Here’s a tree diagram that shows us that basic organization. Let’s look at it more closely. According to x-bar theory, every phrase has a head. The head is the terminal node of the phrase. It’s the node that has no daughters. Whatever category the head is determines the category of the phrase. So if the head is a Noun, then our phrase is a Noun Phrase, abbreviated NP. If the head is a verb (V) then the phrase is a verb phrase (VP). And likewise, if the head is a preposition (P), then the phrase is a preposition phrase (PP), and Adjective Phrases (AP) have Adjectives as their heads. So the bottom-most level of this structure is called the head level, and the top level is called the phrase level. What about the middle level of the structure? Syntacticians love to give funny names to parts of the mental grammar, and this middle level of a phrase structure is called the bar level; that’s where the theory gets its name: X-bar theory. So if every phrase in every sentence in every language has this structure, then it must be the case that every phrase has a head. But you’ll notice in this diagram that these other two pieces, the specifier and the complement, which we haven’t talked about yet, are in parentheses. That’s to show that they’re optional — they might not necessarily be in every phrase. If they’re optional, that means that it should be possible to have a phrase that consists of just a single head — and if we observe some grammaticality judgments, we can think of phrases and even whole sentences that seem to contain a head and nothing else. We could have a noun phrase that consists of a single noun — Coffee? or Spiderman! We could have verb phrase that has nothing in it but a verb, like Stop! or Run! Or an adjective phrase might consist of only a single adjective, like Nice… or Excellent! But X-bar theory proposes that phrases can have more in them than just ahead. A phrase might optionally have another phrase inside it in a position that is sister to the head and daughter to the bar level. If there’s a phrase in that position, it’s called the complement. The most common kinds of head-complement relationship we see are a verb taking an object or a preposition taking an object. Let’s look at some examples. Here we’ve got a verb phrase, with the verb drank as its head. That head has the noun phrase coffee as its sister. 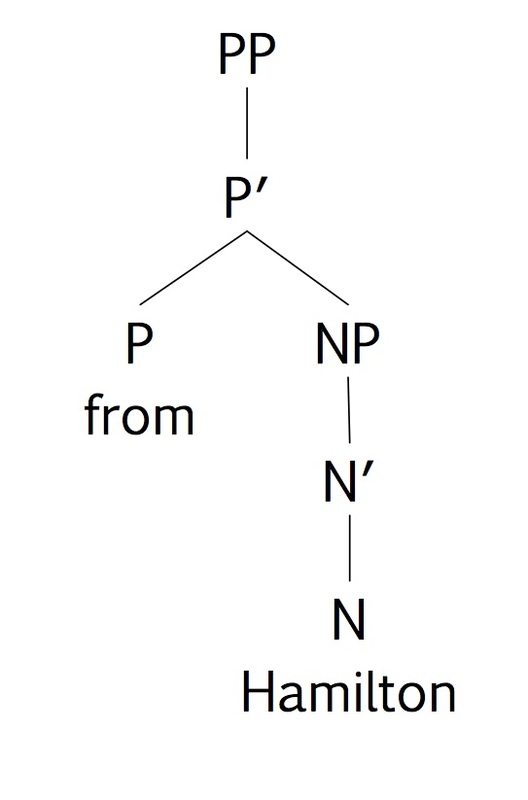 The NP coffee is sister to the verb head and daughter of the V-bar node so it is a complement of the verb. Here’s another example that has the same structure, but a different category. The head of this phrase is the preposition near, so the phrase is a preposition phrase. The complement of the preposition is the noun phrase campus and the whole phrase is near campus. Try to think of some other examples of verbs and prepositions that take noun phrases as their complements. 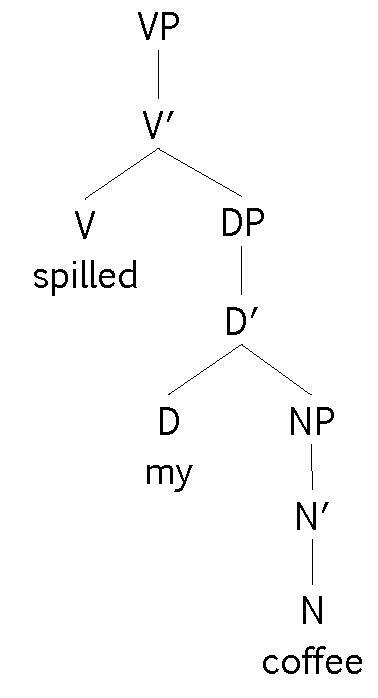 The other common place we see a head-complement relationship is between a determiner and a noun. In phrases like my sister, those shoes, and the weather, the determiner is a head that takes an NP complement. X-bar theory also proposes that phrase can have a specifier. A specifier is a phrase that is sister to the bar-level and daughter to the phrase level. The most common job for specifiers is as the subjects of sentences, so we’ll look at those in another unit.